Happy to say 2018 ended on a high with a 200km DIY Audax followed by a 60-mile ride with Cambridge CTC, followed by the Ely NYE 10k run. This was far better than the start of 2018 which saw me having a fall off my bike on Black Ice, this caused me a great deal of pain and put me out of action for many months… even now I still get a niggle in my side when running! With some care, a few painkillers and lots of determination, I still managed to do all I had planned for and more in 2018, including Cambridge half, riding in Mallorca, Walking in the Dolomites, the Lap of Anglia, run/walking 18 miles, many 200km Audaxes, a couple of 150-mile rides and an epic 300km Audax. The most amazing thing to me is that I have achieved all this while suffering from menopausal hell !!!! My next big goal is to get through January and February without taking any risks in the bad weather and icy conditions which are inevitable !!!! 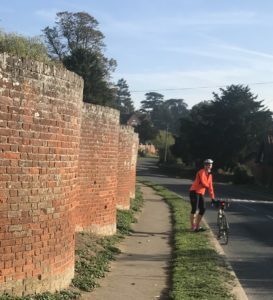 This entry was posted in 10km, Audax, Biking, Personal, Running on December 31, 2018 by Sally. Amazing mild weather for December so today we grabbed at the chance of doing a DIY 200km Audax. Geoff did a great route which took advantage of the tailwind, which helped blow us home, he also chose perfect roads for the night time riding. There is something special about riding in the dark, especially when most people are still asleep it’s also beautiful to see the sunrise. Anyway, that makes three 200km Audaxes in 3 months and now I am wondering if I can keep it up for an RRtY, if so the next one has to be in Cyprus !! 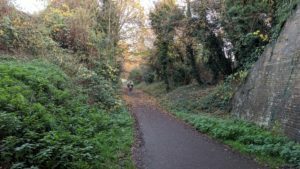 This entry was posted in Audax, Biking, Personal on December 29, 2018 by Sally. As many people will know I love Audax riding, especially long Audax rides, I read all the write-ups about the various rides and admire the riders who do the super long rides which involve night riding, I often wonder just how far I could ride !! 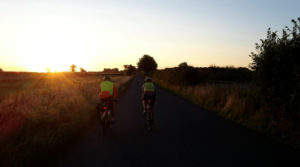 My longest Audax is the Mildenhall 300 km which did involve a couple of hours in the dark but apart from that I have little experience of night riding. 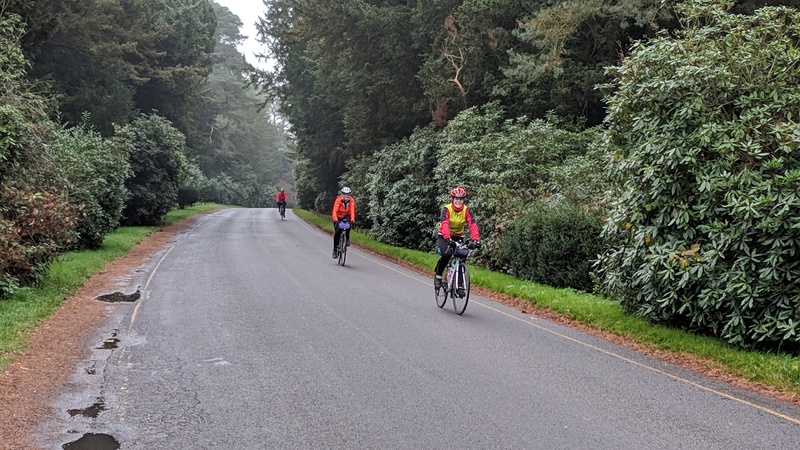 Just recently I have started to ride with the Cambridge CTC, rides which I really enjoy, many of these riders are experienced Audaxers so I enjoy their company the stories they have to tell and soak up all the advice they give about long distance riding. Nigel and Yasmin were planning to ride the Four min mile audax and while Geoff was out on a ride we were invited to join them, when he mentioned it to me I grabbed at the opportunity especially as I know no other women that like to ride long distance. So the alarm was set for 5 am on Saturday 17th November and armed with our egg sandwiches for breakfast we met Nigel and Yasmin at the train station for the 6.24 train to Stevenage. After collecting our receipt in Stevenage we were on our way just after 7 am, the outward ride to Oxford was lovely with perfect weather for the time of year. I especially enjoyed riding through Woburn and seeing all the beautiful autumn colors, we arrived at Iffley Stadium in time for Lunch, the choice of food at the cafe was disappointing but the stadium and Roger Banister memorabilia made up for the lack of choice. The runner in me was drawn to the running track, shame I didn’t have my running shoes but I did have a little jog !! An hour later and we were on our way again, deciding to take a detour down Oxford high street before heading back to Stevenage via Chesham and Welwyn Garden City. Having never been to Oxford it was a very impressive High Street. The aim was to get over the Phoenix Cycle trail near Thame before dark, as the rumor was it had some bad road surface in places. I was very happy we got over it before dark as the surface in place was horrendous with cracks so big you could have easily disappeared down one if not seen. Onward we traveled up and down, then along another cycle track that ended with a steep slippery narrow exit, Nigel made it out but the rest of us got off and walked and that is when Geoff discovered a Puncture, by now it was quite dark, which made changing a puncture very interesting, Geoff opted to change the tyre so didn’t have to look for the offending flint/thorn, after a good 30 mins the puncture was mended, with a helping hand from Nigel who had returned after noticing we were missing. We were happy to be on our way again heading towards Chesham, and a much enjoyed Costa coffee. then it was more climbing and more downhills, along narrow twisting lanes, which made for challenging riding in the dark, a tip from Nigel was to keep my Garmin on the elevation screen so I could see what was coming. By the time we reached Welwyn Garden City my arms were aching from gripping onto my handlebars so much. 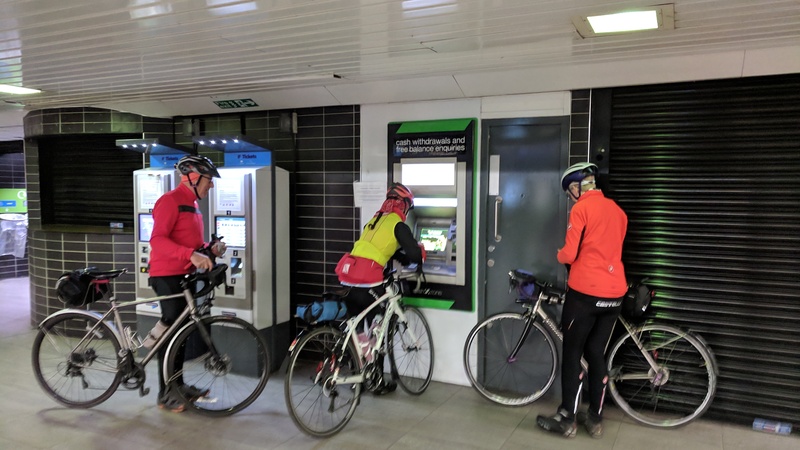 21km left to go back to Stevenage train station, better roads made for easier night riding and we rolled into the station and collected our last receipt with 30 mins to spare. Not the best route for night riding and maybe better the opposite way round but then we would have missed the beautiful scenery around Woburn, but definitely a great calendar event to do. All in all a great adventure with good company and it certainly has not put me off night riding. 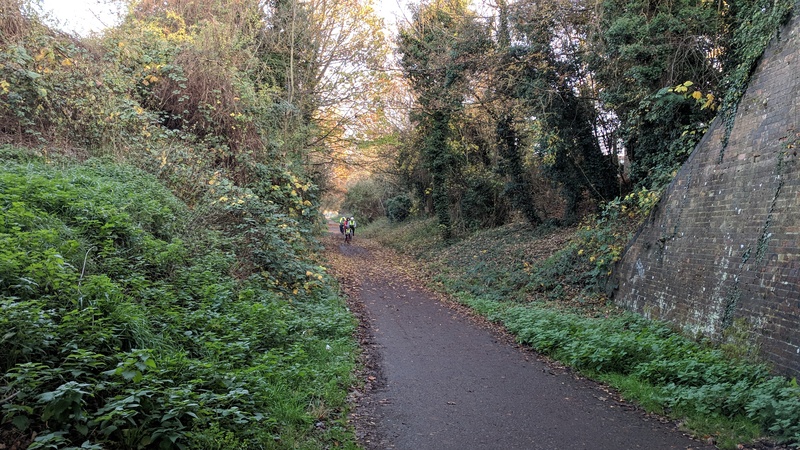 This entry was posted in Audax, Biking on November 21, 2018 by Sally. Finally, my injury seems to be better and the weather is cooling down making it the perfect time of year to start my running again. 8 months ago I booked the first weekend in November at the YHA in Sheringham, for Gina Jayne and myself, the plan was to do some longer run/walks. The week leading up to our weekend away was very wet and we did wonder if the ground would be too muddy but we didn’t have to worry as by the weekend it was perfect weather and perfect underfoot too. 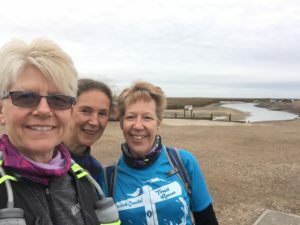 We spent the Saturday run/walking the 18-mile LDWA poppy line route, I use my Garmin 1000 to follow the route, we chat so much along the way that we never really know where we are !! but it works well and soon tells us if we wander off the route. After a beer in the pub, we spent a few hours planning more adventures for next year and had a mad 30 mins entering the Ely New Years Eve 10km, luckily we all got a place. Sunday we woke to another fine day and caught the coastal bus to Blakeney, such a beautiful place. We then ran/walked back along the coast to Sheringham, the shingle beach was a bit of a challenge but much fun was had along the way with many walkers and birders taking time to talk to us,one guy was looking for a rare bird,Jayne soon told him we were the only rare birds to be found here which he quickly agreed too !! The 12 miles were soon covered and after enjoying a delicious Sunday lunch we all made our way home happy after a weekend full of running, walking, eating, drinking and chatting. I am sure we shall be returning to the YHA again next year to do the 26-mile LDWA poppy line route. 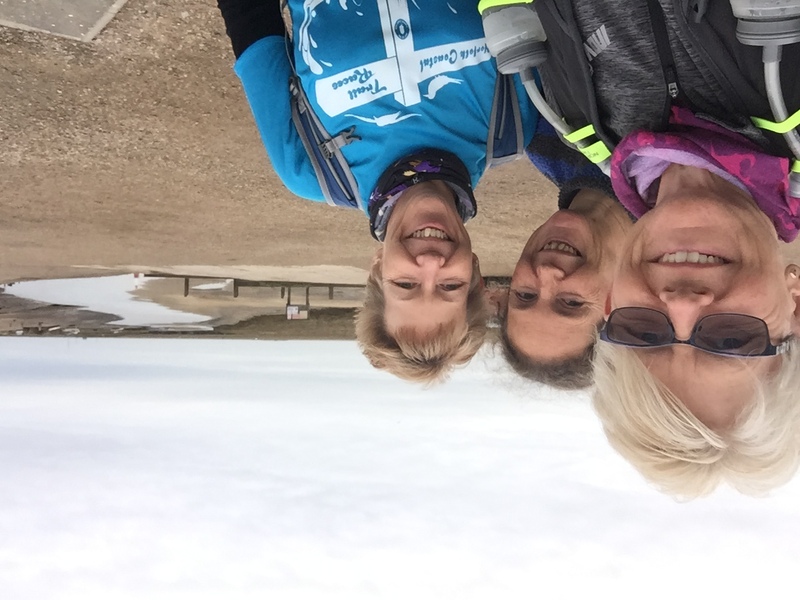 This entry was posted in Personal, Run/Walking, YHA on November 14, 2018 by Sally. I had completely overlooked this Audax ( Thanks to my friend Sue for reminding me! ) so it was a last minute entry and what a good decision it was. It was a fresh cold morning when we left home for the later than usual start at 9.30am, with fog lying in the valleys but the sunshine was forecast for later in the day. Arriving at Debenham nice and early we had time for a coffee and a mingle with the many other riders all out to enjoy the predicted beautiful Autumn day. The route was a figure of 8 so any new riders to Audax could do a shorter 54km while more experienced riders could do the full 100km. Tea and cake were at the church in Debenham at the halfway point, all money going to the local school, very good cake it was too! A great ride on a perfect Autumn day although a few too many stops for us but that’s probably because we are used to doing longer rides. Good to be back out on Annie after my short but sweet love affair with the Pinarello in Mallorca. This entry was posted in Audax, Personal on October 20, 2018 by Sally. Today we headed over to Felixstowe for the yearly sea swim with the Jesus Green regular swimmers. It’s the first time I have joined them at Felixstowe. In the early days they always used to go to Dunwich,where I remember it was always cold and windy with a very rocky beach I also remember how cold I used to get so today I went with no intention of swimming. The weather was also predicted to be wet and as we left Cambridge it was actually pouring with rain,this made me feel quite happy about giving up a cycling day !! 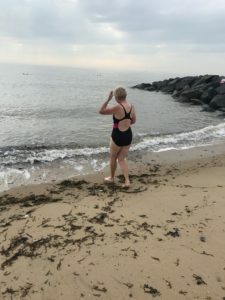 When we arrived at Felixstowe much to out amazement there had been no rain and it was actually quite warm, we made our way to the Fludyers hotel to meet up with the others and enjoy a social cup of coffee while Jane tried to encourage me to swim ! 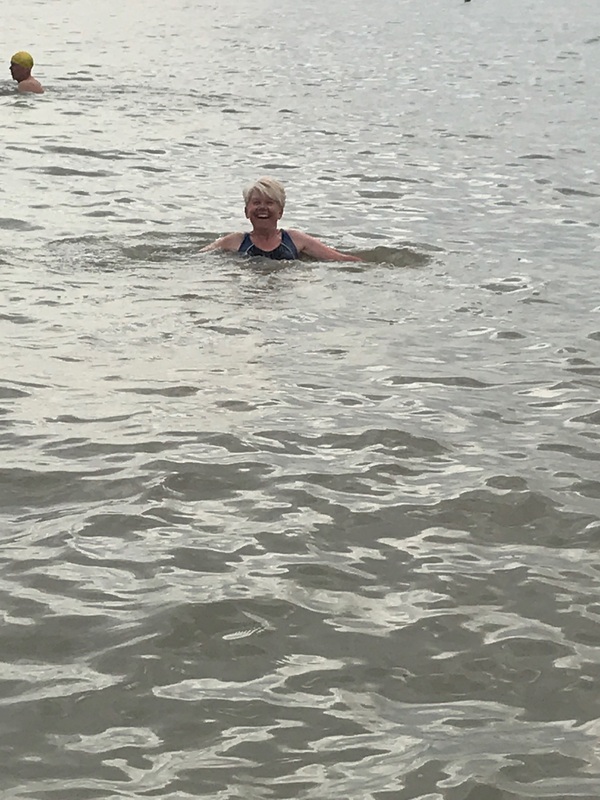 The sea temperature was 15.5 but I still insisted I was not swimming although I did notice it was a nice sandy beach, with lots of nice small groynes. Then I thought it might be rather nice to feel cool for a change since these menopausal flushes drive me so mad !! Getting in was the hardest part as it felt so cold,I was very vocal, just like I am when riding up a large hill !! But once in it felt amazing and exhilarating. I spent the next 30 mins enjoying a fantastic sea swim getting out feeling refreshed and cool but not cold. We then walked along the sea front where we enjoyed lovely fish and chips and I finished the day off with a Rhubarb and Ginger Gin and Tonic. Arriving back in Cambridge we found it was still raining so we definitely had the best weather day today. 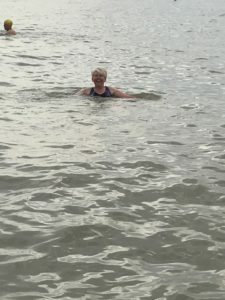 This entry was posted in Personal, Swimming on October 14, 2018 by Sally. In August while Geoff was still away in Russia I suddenly thought the time is slipping away and I still have 2 rides on my Audax list that needed doing before the end of the Audax year in October. 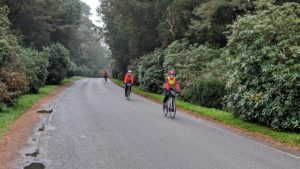 A 300km Audax and a Hilly Audax. I had the Mildenhall Roving 300 in mind as it was close to home, started at 5 am, which I thought would be better than a nighttime start and it was flat. As it seemed we were unlikely to get to Derbyshire for our hilly Audax I was Drawn to the Welland Wonder 160, again close to home starting from Husbands Bosworth. So on Friday 24th August, we booked ourselves into the Barton Mills Travel Lodge, 4 miles from West Row Village Hall and the start of the Mildenhall Roving 300 Audax. We set our Alarm for 3.30am and decided to ride the 4 miles to the start. Apart from one test ride, this was my first experience of riding in the dark. After collecting our brevet card, enjoying a cup of tea and a chat with the other 27 riders it was out into the cold and dark at 5 am to begin our journey. The First stop was at Wally’s cafe for Breakfast an amazing 68k watching the sunrise. After a very welcome hot drink and a bacon sandwich, we left Wallys with Alex, Richard, and Rikki and stayed with them till Halesworth at 157k, around the halfway point. This is where Geoff made a big mistake and had a huge dinner of fish and chips along with 2 bottles of milkshake. We spent the next few miles or so riding on our own till we caught Alex up who unfortunately had a mechanical and a broken chain, we stopped to help but even Geoff with his magic bag of spares did not have the link needed to mend the chain. very sadly we had to leave Alex to make his way back to the train station while we continued on our way. At 197k we rode into Diss on our own, found a Costa coffee and enjoyed a nice slice of cake, which perked Geoff up nicely, then just as we were about to leave Richard and Ricci rode passed and the 4 of us continued on our way to Wymondham. At Wymondham and 221k, my friend Jayne came to see us at the market square while we re-fueled and found the answer to the question, when was the Great fire we then set off on our way to Swaffham and home territory, by the time we reached Swaffham it was dark and with only 50k to go I started to get a real buzz as I realized we were almost finished. After stopping at the shop, for our receipt and more refueling, the guy inside also insisted Geoff had a red bull, for an extra burst of energy, 5 of us set off in the dark towards Mildenhall. The next 50k was some of the most awesome miles I have ever ridden, along a quiet country road, where you could hear every animal and bird sound possible, having a full moon to guide us also helped, at one point an owl appeared and flew along the road above Richard which was just an amazing sight. Then at around 10.15pm, we rode back into West row Village Hall and My First 300k ride was done !!!! We rode back to the travel Lodge making it a 196-mile round trip, after the obligatory Audax Macdonalds, we packed the bikes into the car and drove back to Cambridge, with me wondering if I could do a 600k !!!!!! This entry was posted in Audax on September 25, 2018 by Sally. It’s been a while since I last posted here, 4 months in fact which is far too long. Things are looking up now, my white blood cells are behaving, my shoulder and back improving by the week and the hot flushes that I thought might kill me, seem to be under control with a magic pill from the Doctor! After the long cold winter months I finally got out to do my first Audax of the year with Geoff, it was, in fact, my longest ride to date 142 miles, a permanent route called the Pork Pie and very hilly might I add. Straight back from Mallorca to run the GEAR 10k an amazing event with all the ladybirds and my Norwich running friends, I was a little slower due to my back but I did it. Another 200 km Audax enjoyed with Geoff from Long Melford, I really enjoy these longer rides. 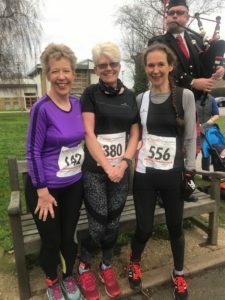 And then just for fun, I met up with my lovely Norwich running friends at Debden winery for the wine run, 6 wine tasting stops around a 10 km mainly off road run. I would estimate we drank 30 shots of wine, after crossing the finish line you received a huge glass of wine with your medal, we then enjoyed a really fun happy afternoon with a BBQ and yes you guessed wine !! I am still having problems with my back when I run but it is much improved, I can only hope it keeps improving so I can start training for Wissey half soon as I miss my running so much ……. 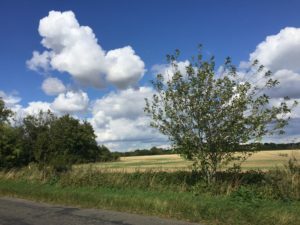 This entry was posted in 10km, Audax, Friends, GEAR 10k, Half Marathon, Ladybirds, Mallorca, Run/Walking, Running, SWNC on June 17, 2018 by Sally.